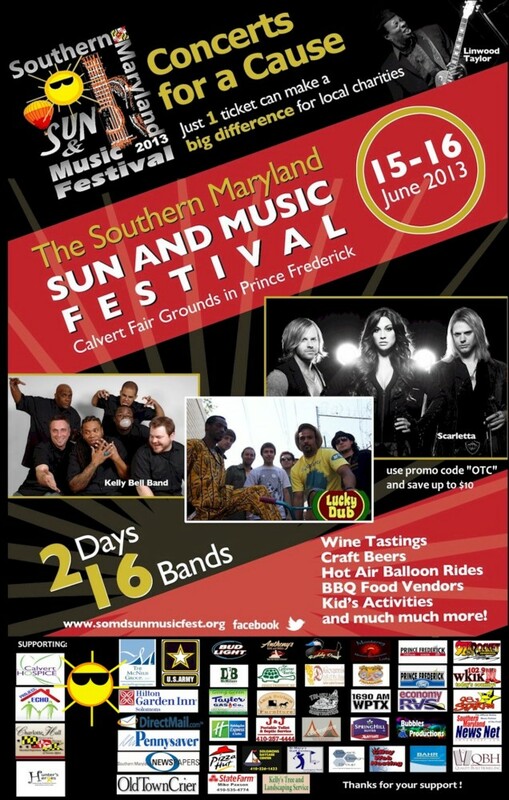 Spirits in the Sky Benefit LLC, a Maryland Benefit LLC, announced the details of the 2013 “Southern Maryland Sun & Music Festival” at the Calvert County Fairgrounds in Prince Frederick, Maryland on June 15 & 16, 2013 are now complete. Advance tickets went on Sale on April 25, 2013. Discounts are available for online purchases at our website www.somdsunmusicfest.org. Please use Promo Code “FEST” at check out. This year’s music combines all genres of music from National, Regional, and Local Musicians. This year’s headliner for Saturday, June 15th is Scarletta. One of the fastest emerging country acts on the music scene. Scarletta was honored to be chosen as Billboard’s “Top Ten Artist to Watch in 2013” CMA has also chosen them as a CMA Close Up “Who’s New to watch in 2013” Their two latest videos, “Island Fever” and “Right here right now” Are rapidly becoming an overnight success.